J.R.’s Microgreens are grown using organic, sustainable practices and harvested in Virginia Beach. They are naturally packed full of vitamins and minerals including vitamin C, vitamin E, and beta carotene at levels four to six times higher than the mature leaves of the same plant. J.R.’s Microgreens are sold live in variously sized planters for optimum freshness, or cut and bagged on site on request. 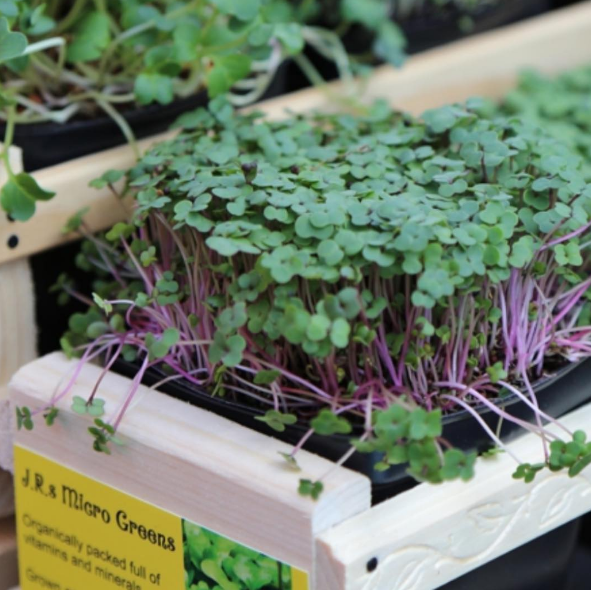 This method ensures the microgreens taste their best, and increases their health benefits. Head over to the About page to learn more about our growing practices, the many benefits of fresh microgreens, and our sustainability practices. There are several reports, articles, and studies about the benefits of incorporating microgreens into your diet. In a 2012 study, Gene Lester, a researcher with the U.S. Department of Agriculture, and his colleagues at University of Maryland, College Park, looked at four groups of vitamins and other phytochemicals – including vitamin C, vitamin E, and beta carotene — in 25 varieties of microgreens. They found that leaves from almost all of the microgreens had four to six times more nutrients than the mature leaves of the same plant. But there was variation among them – red cabbage was highest in vitamin C, for instance, while the green daikon radish microgreens had the most vitamin E.
Bhimu Patil, a professor of horticulture and director of the Vegetable and Fruit Improvement Center at Texas A&M University, agrees that microgreens may potentially have higher levels of nutrients than mature vegetables. J.R.’s Microgreens are currently available at the Old Beach Farmers Market and the King’s Grant Farmers Market. OBFM is a fresh outdoor marketplace, just six blocks from the ocean and one block from the Virginia Beach Convention Center, in the parking lot of Croc’s19th Street Bistro. They feature seasonal fresh fruits and vegetables, meats (pork, bison, beef, chicken, turkey, sausages, charcuterie), eggs, seafood, cheeses, a wide assortment of baked goods and savory foods from local chefs, soap, and flowers. Founded in 2008, OBFM is run entirely by volunteers as an independent 501(c)6 organization. We support local family farms, watermen, and Virginia wineries.OBFM is a certified Virginia Green market, encouraging eco-friendly practices. Walk over or ride a bike. Bring a reusable shopping bag. Come discover the taste of fresh, seasonal fare. Follow OBFM on Facebook or Instagram, and check out their website for more information and to view other passionate local vendors. The King’s Grant Farmers Market exists to promote a multi-generational community that supports local farmers, encourages sustainable living, and creates vibrant community gatherings. Follow King’s Grant Farmers Market on Facebook or Instagram, and check out their website for more information. Have any questions or comments? Want more information? Contact Jack at jackrharman@icloud.com or 757-316-7880. You may also fill out the comment form below.